← The Idiots guide to Greece, Euro problems and defaulting on debt. Everyone knows that HRH Queen Elizabeth II is the Head of State for the United Kingdom of Great Britain and Northern Ireland. Less well known is her husband HRH the Duke of Edinburgh or simply Prince Philip as he is known to most people. Having recently celebrated his 94th birthday, he is the oldest ever male in the British royal family and still a very active one too. He was born into both the Danish and Greek royal families on 10th June 1921 but his family were soon forced to flee his Greek homeland and by 1939 he found himself serving in the Royal Navy where he saw repeated action in the Mediterranean and later Pacific fleets. 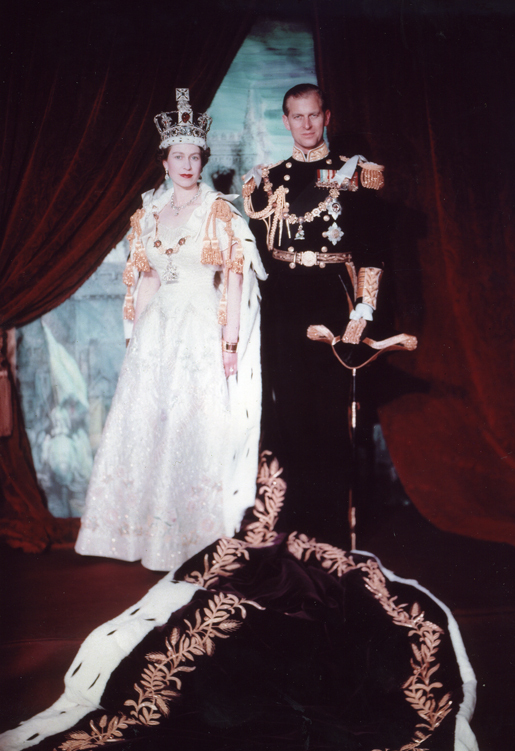 It was in 1939 that he began corresponding with the young Princess Elizabeth who was destined to become Queen and after the war when Philip was given permission to marry her, he was forced to renounce all claims to both the Danish and Greek thrones though like many other European royals, he was descended from Queen Victoria and is currently her oldest surviving Great-Great Grandchild. Prince Philip is a keen proponent of environmental affairs and is the patron of over 800 worthy charitable organisations as well as heading the Duke of Edinburgh Award Scheme which now runs in over 150 skills and aims to instil the virtues of volunteering to individuals or the community, improving physical and sporting prowess, developing practical and social skills as well as the famous planning, training for and completing an expedition. One of the many roles of the Queen is to be head of the Church of England, a link back to times when the king or queen was assumed to be ruling on earth on behalf of God. Prince Philip however has gone one better, he is officially a god. As strange as it may be, the Kastom people of Yaohnanen on the island of Tanna in Vanuatu consider him a divine being. According to ancient tales, the son of a mountain spirit travelled over the seas to a distant land. There he married a powerful lady and in time would return to them. When Queen Elizabeth visited the island and the locals saw the respect and honours that were bestowed upon her, they realised that her husband, Prince Philip, must in fact be the fulfilment of the ancient prophecy. It’s origins are thought to have started back in the 1950’s or 60’s but really took off in 1974 when the royal couple visited the island and the bemused Prince was observed from a distance by some of the villagers. Later the local British High Commissioner suggested to the prince that he should send an autographed photo to the villagers which apparently went down very well so they sent him one of their traditional pig killing clubs with Prince Philip happily sending them a photo back of him posing with their gift. 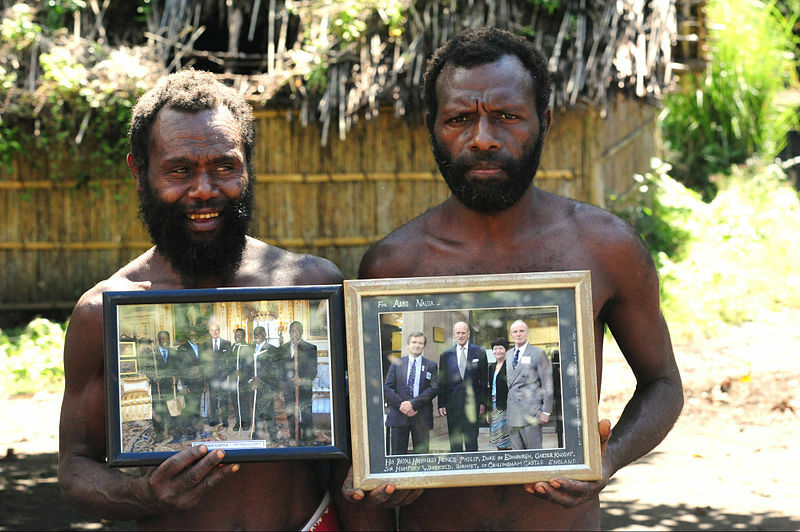 Two Yaohnanen Tribesmane proudly show off their photo of the 2007 royal visit with their god, Prince Philip. Photo by Christopher Thompson. Of course no-one is perfect, not even a god and despite everything else and performing his constitutional role of consort to the monarch for decades and no doubt opening thens of thousands of hospitals, bridges, schools and the like, it is probably safe to say that he is mostly thought of forces ability to put his foot in his mouth and say the wrong thing which even he acknowledges to have gained him a reputation. He would say that he is jokey to make people feel at ease and no doubt for him after a life-time of ceremonial duties, make things a bit interesting. Some of the things he says could be considered rude and even offensive and sometimes it is hard to tell whether it is the mutterings of someone from almost a life-time ago or whether he is forgetful or just mischievous. Even this morning Prince Philip is in the news for accompanying the Queen to open a Asian Womans Community Centre in east London where he asked them “who they sponged off” and whether they came here just to gossip. Personally, I and many others find it all quite hilarious and I like it that someone so important just speaks his mind and doesn’t worry about voters or share-holders. A fine example of this occurred last week at a photo-session with surviving pilots from the Battle of Britain when he told a photographer to get on with taking the photo. It’s true that no-one else complained of the delays but how long should a 94 year old wait for his photo to be taken as every around him chatters and after no doubt being burdened by his uniform in the summer sun for hours. We’ve all probably seen relations much younger the Prince Philip get fed up waiting for a photo to be taken. It’s not hard to find a list of some of the finest pearls of wisdom from Prince Philip. Whatever the embarrassing situation, Prince Philip has probably been there and done that. Whether it was leaving his limo in Liverpool and asking whether the wheels will still be on it when he returns, telling President Obama he is too fat to fit in an astronauts suit, admonishing Cambridge professors who corrected him on a technical theory”I didn’t come here to be bloody well lectured by the likes of you. The following list is mostly taken from the Daily Mirror newspaper. 23 “We go into the red next year… I shall have to give up polo.” 1969. 74 “I must be the only person in Britain glad to see the back of that plane.” He hated the noise Concorde made flying over Buckingham Palace, 2002. 97. If it has four legs and is not a chair, has wings and is not an aeroplane, or swims and is not a submarine, the Cantonese will eat it. I wonder whether anyone else since 1851 has managed to use the word ‘buffoon’ in their blog title? Have a nice weekend everyone! This entry was posted in Funny & Humour, history, Life and tagged embarrassing moments, Funny, Gaffes, God, history, Humor, Humour, Life, Long reads, Prince Philip, Quotes, Royal Family, UK news. Bookmark the permalink.